2018 saw the launch of the Personal Essentials Ministry, one of the newest Missions ministries at Manchester United Methodist Church. We began the year with a pilot program where we committed to providing specified quantities of five items each month: 3,600 rolls of toilet paper, 600 bottles of shampoo, 360 boxes of 36 count tampons, 600 packs of 4 count razors, and 600 cans of shaving cream. This was an ambitious goal as we set out to support dignity and hope for all people through providing personal care items. We set out to support dignity and hope for all people through providing personal care items. In our pilot program, the Personal Essentials Ministry and Circle of Concern together learned a few lessons. 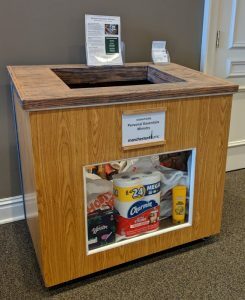 First, we learned that our congregation loves donating toilet paper, and this happens to match with how toilet paper is the most requested item at Circle of Concern. Similarly, donations of shaving cream were low, but this matched with how shaving cream was least requested by Circle of Concern clients. Only 80 of the 600 families served by Circle of Concern each month partook of all five items we provided when given the option to; all other client families picked and chose according to their needs. “choice” pantry model where clients are able to shop for their needs rather than receiving a pre-made box of food or toiletries. This change is critical as it helps restore dignity through creating an experience similar to that of an everyday shopping trip, rather than receiving a hand-out. Altogether, Circle of Concern learned that their needs were lower than the amounts we had committed to provide, and we learned that some items were coming in more frequently than others. As such, we are moving towards continuing to collect toilet paper, shampoo, tampons, razors, and shaving cream, while only committing to providing the number of 3,600 rolls of toilet paper a month. Going forward, we will also be welcoming donations of laundry detergent and diapers size 5 and 6, as these are two personal essentials needs that are in high demand at Circle of Concern. 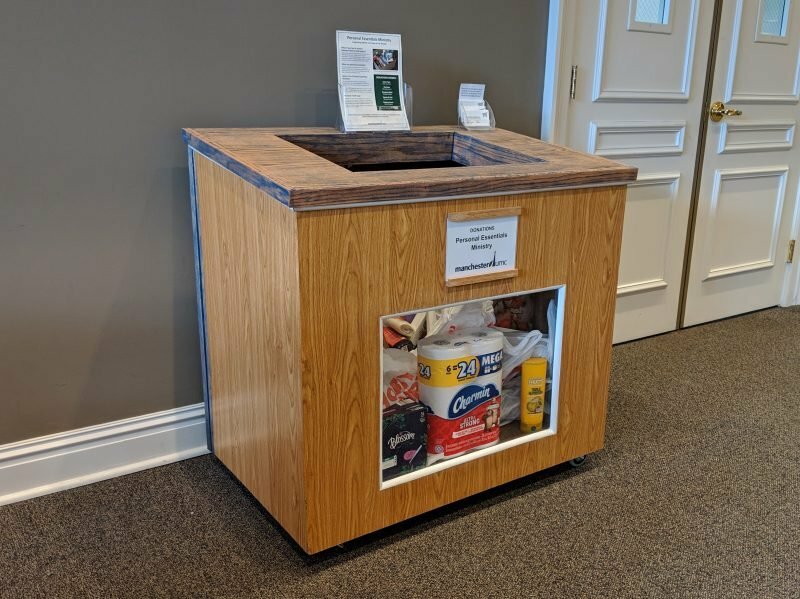 Physical donations can be brought to the new Personal Essentials Ministry donation bin in the main lobby, a gift created by Michael Smalley, a parent in our Circle of Friends Preschool. We give thanks for all the incredible generosity that Manchester UMC has shown Personal Essentials Ministry and the families of Circle of Concern in 2018 through your continued support. We are excited for a fantastic 2019! If you’d like to learn more, donate, or volunteer to help collect, sort, deliver items, please contact Cindy Wolk at 314-795-1982.